Are you feeling Super Cute today? Well, you look super cute. Trust me. I can see through the internet and you are amazing, yo. So, on such a Super Cute day, we must have some Super Cute Bows, right? This week, I went with some Vintage Mod Patterns because I felt like it. And when you feel like doing something fun, you should, right? This Super Cute Mod Vintage Bows printable has four fun Vintage Mod Patterns for the Vintage Mod lover in you! 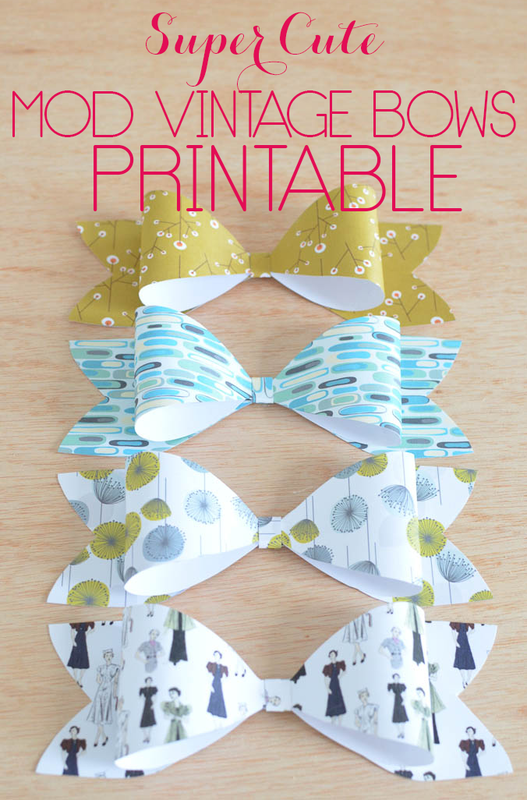 For detailed instructions on how to assemble these bows, just visit this post. To download and print this pdf printable, just click here. If you liked this printable, subscribe to my newsletter and you’ll receive my 10 week series of Gold Foil Printables! The Bold Abode is a participant in the Amazon Services LLC Associates Program, an affiliate advertising program designed to provide a means for sites to earn advertising fees by advertising and linking to amazon.com as well as other affiliate networks. Adorbs! This bow idea in general is pretty amazing though, to be honest. The prints on these just put them over the top! Thanks, Courtenay! I do love these Mod prints!